Leverage Big Data analytics methodologies to add value to geophysical and petrophysical exploration data. Enhance Oil & Gas Exploration with Data-Driven Geophysical and Petrophysical Models demonstrates a new approach to geophysics and petrophysics data analysis using the latest methods drawn from Big Data. Written by two geophysicists with a combined 30 years in the industry, this book shows you how to leverage continually maturing computational intelligence to gain deeper insight from specific exploration data. Case studies illustrate the value propositions of this alternative analytical workflow, and in-depth discussion addresses the many Big Data issues in geophysics and petrophysics. From data collection and context through real-world everyday applications, this book provides an essential resource for anyone involved in oil and gas exploration. Recent and continual advances in machine learning are driving a rapid increase in empirical modeling capabilities. 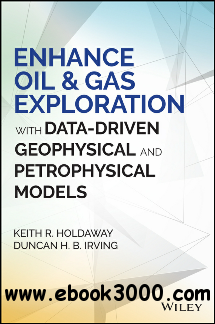 This book shows you how these new tools and methodologies can enhance geophysical and petrophysical data analysis, increasing the value of your exploration data. Data-driven modeling focuses on analyzing the total data within a system, with the goal of uncovering connections between input and output without definitive knowledge of the system's physical behavior. This multi-faceted approach pushes the boundaries of conventional modeling, and brings diverse fields of study together to apply new information and technology in new and more valuable ways. Enhance Oil & Gas Exploration with Data-Driven Geophysical and Petrophysical Models takes you beyond traditional deterministic interpretation to the future of exploration data analysis.